DefensiveDriving.com wishes you and your family a safe and happy holiday! AAA estimates approximately 42.2 MILLION people will travel more than 50 miles away from their homes for this holiday weekend, starting today and the number of people traveling is up over 11% compared to last weekend. 1) Make sure your vehicle is regularly and properly maintained. Your tires are full, gas tank full, your lights and windshield wipers work. 2) Plan ahead, have a route and a plan to get where you are going and allow for delays. 3) Obey the speed limit. There are a lot of people driving out there – speed is the number one factor in severity of injury. Arrive alive, take your time. 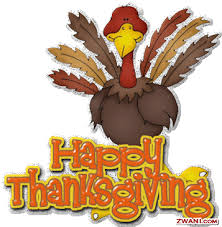 Happy Thanksgiving from the DefensiveDriving.com family!